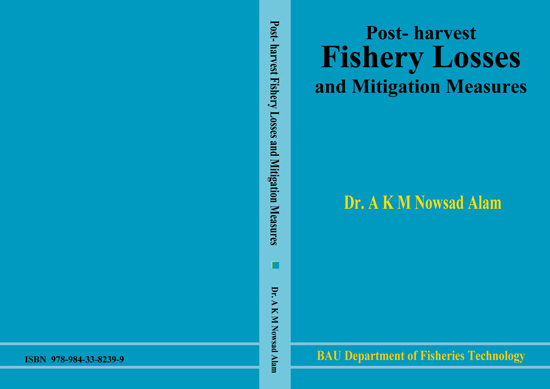 “Post-harvest Fishery Losses and Mitigation Measures” – a new book on post-harvest fisheries, authored by Professor Dr. A K M Nowsad Alam, is published by the BAU Department of Fisheries Technology. Huge post-harvest loss in every year in tropical countries is a very common feature of fish marketing and small-scale fisheries. Pragmatic classification of fish loss explains four common categories, viz. physical loss, quality loss, nutritional loss and market force loss. Physical loss is often transformed into economic loss when spoilage of wet fish causes a reduction in its value or when there is a need to reprocess cured fish, increasing the cost to the processors. Traditional processing can cause depletion in nutrient availability, leading to nutritional loss. In this book, the post-harvest fisheries of Bangladesh from harvest to retail sale have been brought on the dissection table, the adversities and opportunities are analyzed using various participatory tools; component-wise post-harvest losses of fish are assessed using sensory methods, standardized with biochemical indices; appropriate protocols for the reduction of losses are outlined and intervention strategies for a sustainable fish handling, transportation and processing system are recommended. A new method has been proposed to quantify the post-harvest quality loss of wet fish. The assessments were conducted on 28 major commercial fish species in different steps of major distribution channels in Bangladesh for several years. Sensory quality defect point data were standardized with corresponding biochemical and microbiological quality indicators through interval estimate between different parameters based on regression analysis. Percent quality loss of fish at each step of distribution channel was determined, constructing a (1- α) confidence interval for average percentage of defective fish. As seen, majority of the fishes do not lose quality in the fishermen and fish farmers, landing centers or commission agents in primary fish market. Most of the quality losses are initiated at the transporters and commission agents. The new method can be applied to any fish anywhere in quantifying the qualitative loss. This 340-page with 80 g glossy colour print book offers a domestic price of BDT. 1,000.00 and overseas price of US$ 25.00 only. If you are interested to collect this book you may contact to the author addressed Professor Dr. A K M Nowsad Alam, Department of Fisheries Technology, Bangladesh Agricultural University. Visited 1,147 times, 1 visits today | Have any fisheries relevant question?